- Lighter snow showers Saturday morning becoming heavier later in the day. Then heavy snow expected for Saturday night. Snow should linger into Sunday morning, with lighter showers into the afternoon before ending by evening. Ridgetop winds gusting to 60+ mph Saturday morning and increasing to 100 mph by Saturday night. Then coming down on Sunday through the day. 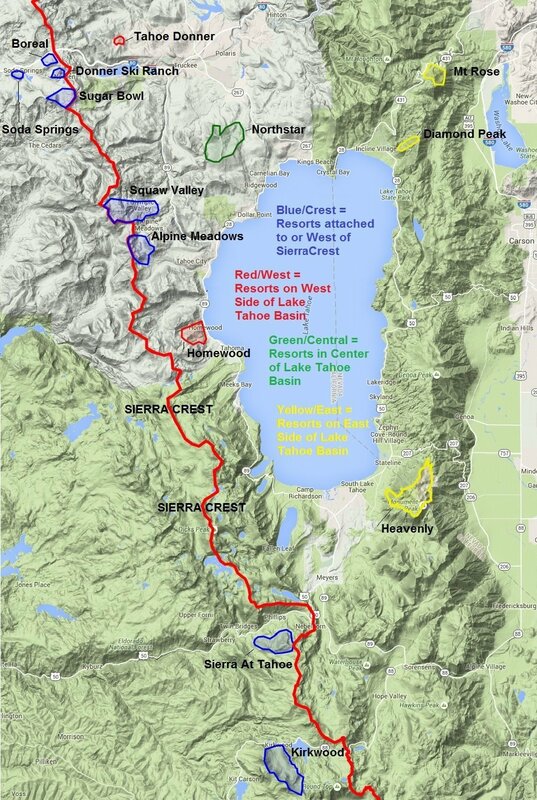 We could see an additional 1.5 – 3 feet on the mountains, and 1-2 feet at lake level by Sunday evening. - We should see a break Sunday night into Tuesday. Partly clouds skies with highs only in the 20’s and lighter winds. 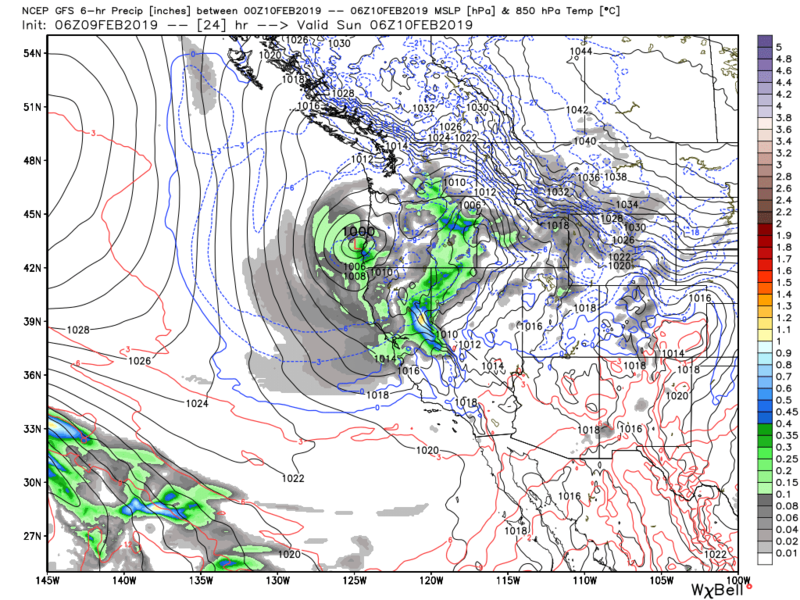 - By Tuesday night into Wednesday night another cold storm could drop in from the Gulf of Alaska. This storm could bring another 1-3 feet of snow if the current model runs hold. - There could be another break Thursday. Then 2 more cold systems could drop down from the Gulf of Alaska for the weekend of the 15th-17th. - The active pattern could continue through the week of the 18th. The first of two systems moved through overnight and is finishing up this morning. You can see the next stronger system working down the coast from the north. This first system was a weaker system as expected. We were only expecting 2-5 inches of snow overnight. Reports this morning are 1-8 inches. So the storms are performing as expected so far. We have scattered snow showers this morning with some heavier bands of snow setting up over some areas. The ridge top winds are gusting to 60+ mph this morning. That could affect some upper mountain lift operations. The next system moving down the coast will push a cold front in by this evening with plenty of convective snow over the mountains with the very cold unstable air behind the front through tonight. We should see snowfall rates pick up later today with heavy snow for tonight. Ridgetop winds could hit 100 mph tonight with the front. Tonight with the heavy snow, high snow ratios creating powdery snow, and high winds, driving will be tough with low visibility. 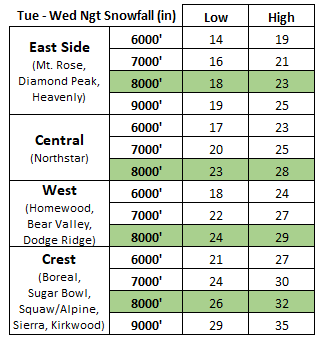 Snow levels around 3,500 feet today fall to 1,500 feet tonight. Snow ratios of 13-17:1 today increase to 15-20:1 tonight. We could see another 2-5 inches of snow today before the heavier snow moves in by this evening. Then we could see another 1-2 feet overnight by Sunday morning. The heavy snow looks like it becomes lighter Sunday morning with scattered snow showers Sunday afternoon before ending. The winds will start to drop Sunday morning, possibly dropping off enough later in the morning or early afternoon for all of the upper mountain lifts to open. We could see 1-3 inches of final accumulation on Sunday. while the GFS only has up to 1.4 inches. The European model has 2.2 inches. The GFS/Euro average and total model average is closer to 1.8 inches. The NAM would bring up to 44 inches and the GFS only up to 24 inches. So I still have a conservative snowfall forecast for the remainder of the storm at 17-31 inches on the mountains by Sunday evening. 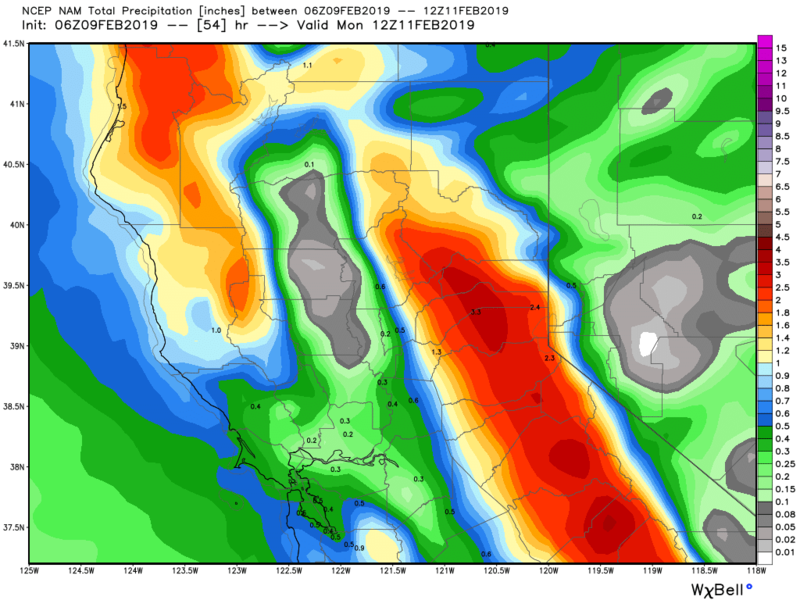 We can just be pleasantly surprised if the wettest models are right. We may have a break Sunday night into at least Tuesday morning with partly cloudy skies. Can't rule out the chance for a flake or two from passing clouds. The next cold system drops down from the Gulf of Alaska on Tuesday and should move in by Tuesday night. Then possibly lasting into Wednesday night before moving out. 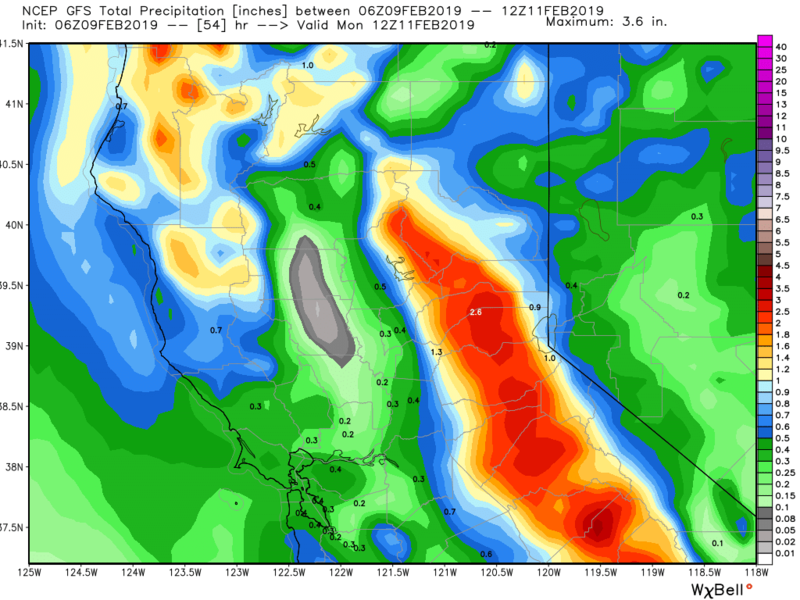 The latest model runs show that we could see some additional moisture pulled into the storm from the subtropical jet stream over Southern CA, but they are keeping us cold with the warm moisture feed stay to the south. So we could see another cold system with high snow ratios if the current model runs hold. The range for the initial forecast for this storm is another 1-3 feet of snow. We will be watching this system closely over the next few days. 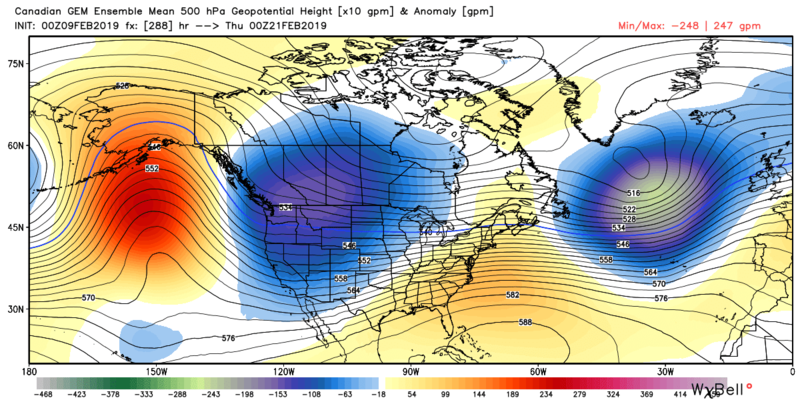 The trough looks like it will remain over the West Coast through the 3rd week of February. That should continue the cold systems dropping down from the Gulf of Alaska. After a possible break on Thursday, we could see 2 more cold systems drop in next weekend. One Friday and another Sunday. 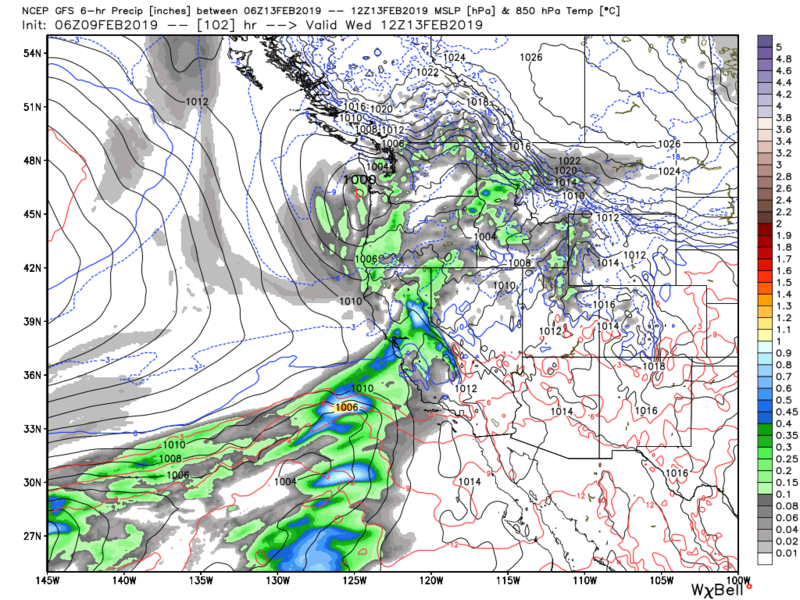 The latest model runs continue to keep the subtropical jet stream into Southern CA with the northern branch into Northern CA keeping these storms cold. So we could add more powdery snow to the impressive snowfall amounts next weekend. 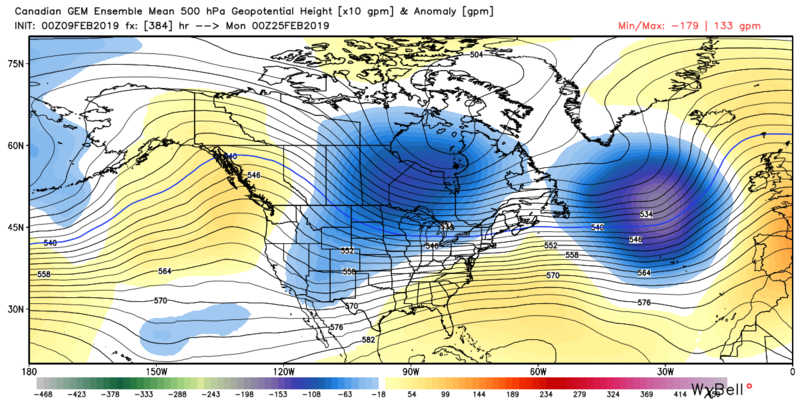 The GFS and European ensemble runs are showing the trough remaining over the West Coast into the last week of February. 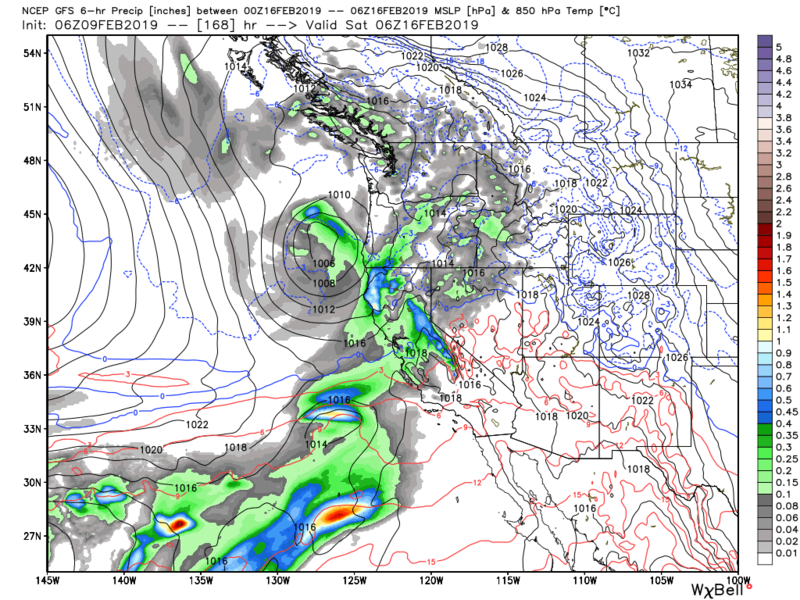 The Canadian model still suggests the ridge moves closer to the West Coast. We will have to keep watching. It is possible that as the MJO moves further east in the Pacific later in the month we could see the pattern shift and see a brief drier pattern. If you are traveling through the Sierra please use the links below for travel advisories as we do not give our opinions for the "safest" travel times for liability reasons. 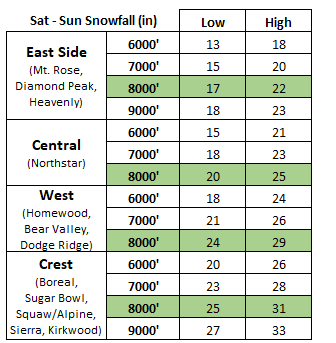 You can also follow our I-80 Daily Snow forecast as well.